On this page, 4b Controlling Tools, we cover basic controlling tools for controlling the scope, schedule and cost. 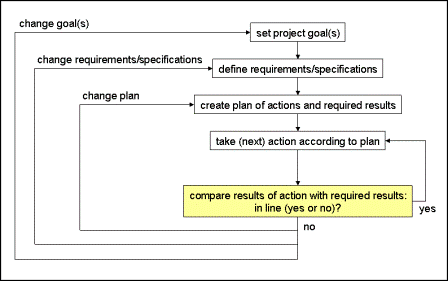 Referring to the basic control cycle let us introduce how we use our planning documents to support the comparison of actual with required results from a project management point of view. The WBS gives us a complete overview of all the work of the project in form of a structured list or graphical representation of work packages. Each work page describes details of that particular part of the work and required results. Consequently, we can use the WBS in order to compare actual with required results - work package by work package. Similarly, we can use the network diagram to compare actual with required results - again work package by work package. work package 1.1.2: not yet started.